Yes yes, everyone’s excited to get their hands on Marvel’s Spider-Man. You’ve read our review, your copy is en route to your porch, and you’re eager to play your newest purchase. But I know why you’re really here, frantically scouring headlines during your lunch break or on the commute home. You want to know what the web swinging mechanics feel like. Buckle up, bucko—I’ve got your back. The swinging in Spider-Man is definitely based on momentum. There are right and wrong ways to gain speed and traverse the city, and that speed can disappear in an instant should you smack into a corner the wrong way. And it’s obvious that swinging out of a long dive gives much more speed than swinging from a standstill, street-level jump. I can’t fully tell whether or not Spidey’s webs attach directly to buildings. I can tell that it’s close enough to count. When you’re swinging high in an avenue surrounded by tall towers on one side and short apartments on the other, your webs definitely favor the higher perches. 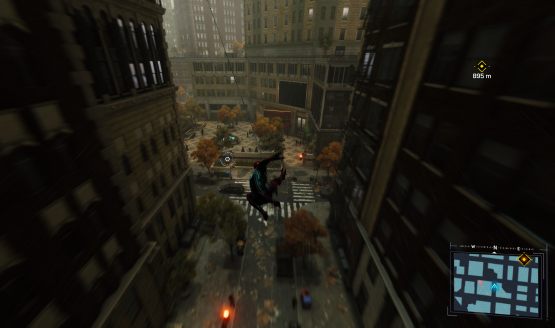 If you’re way the New York skyline and hurtling down, you can’t launch a web until you’re dangerously close to the ground—well below the height of the surrounding buildings. Similarly, you can’t fling your heart out above Central Park, because there are no skyscrapers or shops to swing from. It doesn’t seem that this swinging works quite the same as the dearly beloved 2004 game Spider-Man 2, which I have no true attachment to. However, this doesn’t mean the swinging in Marvel’s Spider-Man is bad or inferior in any way. It just doesn’t use the same mechanics as those from 14 years ago. That’s a good thing, as consoles and game engines have come a long way since the PlayStation 2. Insomniac Games was able to add a lot more depth and immersion to the swinging experience. 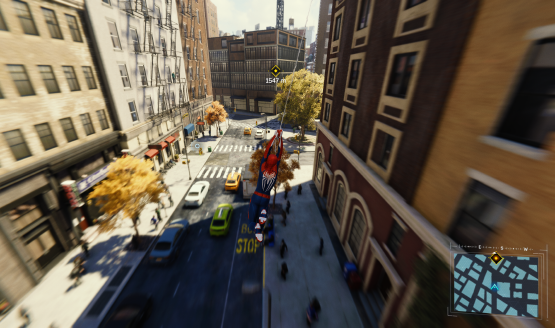 In Marvel’s Spider-Man, you start swinging by pressing or holding R2 in mid-air. Technically, that’s all you need to do: you could hold R2 and leisurely clamber around Manhattan, adjusting your trajectory whenever you see fit. But that’s admittedly slow and boring. The real fun comes in the form of the X button, which forces Spidey to jump mid-swing. If you continue holding R2 after this jump, you’ll shoot a new web at the next opportunity. For a little more speed, hold R2 and experiment with pressing X at various times to control the trajectory of your post-web launch. This means exactly what your high-school-physics-teacher thinks it means. Pressing X at the lowest point of the swing will rocket you forward, while pressing it at the end of the swing will catapult you skyward. This might seem basic, but it’s honestly daunting to execute at high speeds. That’s especially true when you’re chasing a runaway van or a pigeon. Quick swings aren’t the only way to get around town, though. 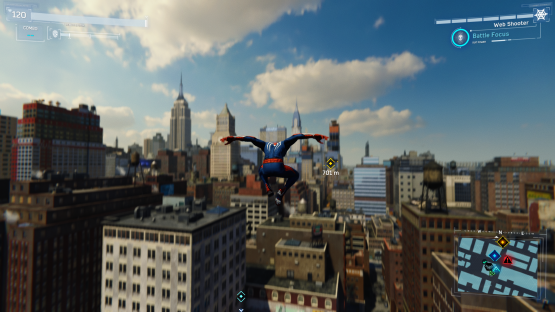 When you’re near a building and aren’t attached to a web, you can press X (without holding R2) to perform a “web zip.” This gives you some extra lateral movement without having to perform a full swing. You can also run on walls by holding R2 towards one. If used correctly, it can negate some of the momentum you’d normally lose when slamming into a building. It’s also helpful when you need some quick vertical movement. Spider-Man’s skill trees let you augment this experience a bit, and you’ll likely get most skills before you finish the game. One early ability lets you web-zip twice in quick succession. Another lets you press X upon hitting the ground for a “quick recovery,” jettisoning you forward. Yet another allows you to hold R2 and X while running or standing still to charge a “super jump.” This will give you some quick verticality, although wall-running and swing manipulation may be more versatile options. For the most impact (and the most control over your NYC traversal), use a combination of all these tactics. Jump out of your swing low and web zip a few times for speed. Jump high and wall run for height. If you want even more control, try letting go of R2 when you jump out of a swing, and press again only when you think you should swing next. This will let you maximize your jump and subsequent fall distance, as the game’s automatic swinging can slow you down just a tad. Most importantly, have fun with it! Web slingin’, flingin’, and swingin’ mechanics are much too satisfying for you to focus solely on speed. Use your momentum-based toolkit to master comfortable maneuvering. Take that knowledge and explore Marvel’s Spider-Man at your own leisurely, friendly neighborhood pace!